Brief history of ear candling or ear coning an ancient therapeutic art. Ear candling is not a new alternative therapy... Dating back to the year 2500 B.C. there is evidence showing that people used and were familiar with the practice of ear candling. Ancient cultures, including the Egyptians, made reference to its use. Parchment scrolls discovered in the Orient, also have described the procedure for ear candling, also known as ear coning. This ancient therapeutic art may have been developed with the domestication of the honeybee. Beeswax was  and still is  a key component to making the hollow cylinders used in the procedure. The principal cloth used by ancient Egyptians was linen made from flax (the fibers of an annual blue-flowered plant). 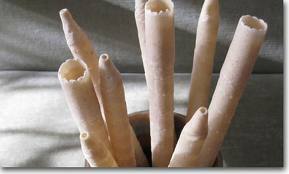 Today, as in times past... high-quality, ear candles are handmade from beeswax and unbleached cotton cloths. These specially fabricated candles are typically nine (9) to twelve (12) inches long and will burn for approximately ten minutes. Through a process called "convection" softer waxes and toxins will be drawn out of the ear, oxidized and turned into vapors during the procedure. This simple and time-proven therapy can be very effective in removing old and troublesome blockages from the ear canal, without the use of solutions or probes. Many people attest to the value of ear candling in cleansing the ear canals and sinus passages. may be used to effectively solve many ear problems.